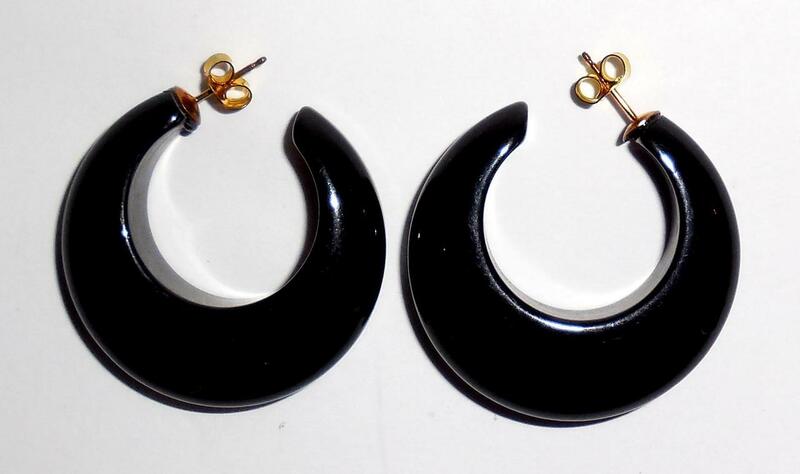 Old stock from a jewelry store that closed years ago this is a thick, chunky pair of vintage black plastic large crescent pierced post earrings. Older plastic with the color in the plastic when made rather than dyed later. Only every used for display they are in excellent, ready to wear condition. No damage or repair. Minimal wear. Size of each earring is just about 1 1/2" North to Sout from the top of the crescent to the bottom. Width of the center bottom of the crescent is 1/2". Depth is 1/2". The insides are matte. The outsides are well polished. Look and feel like bakelite. 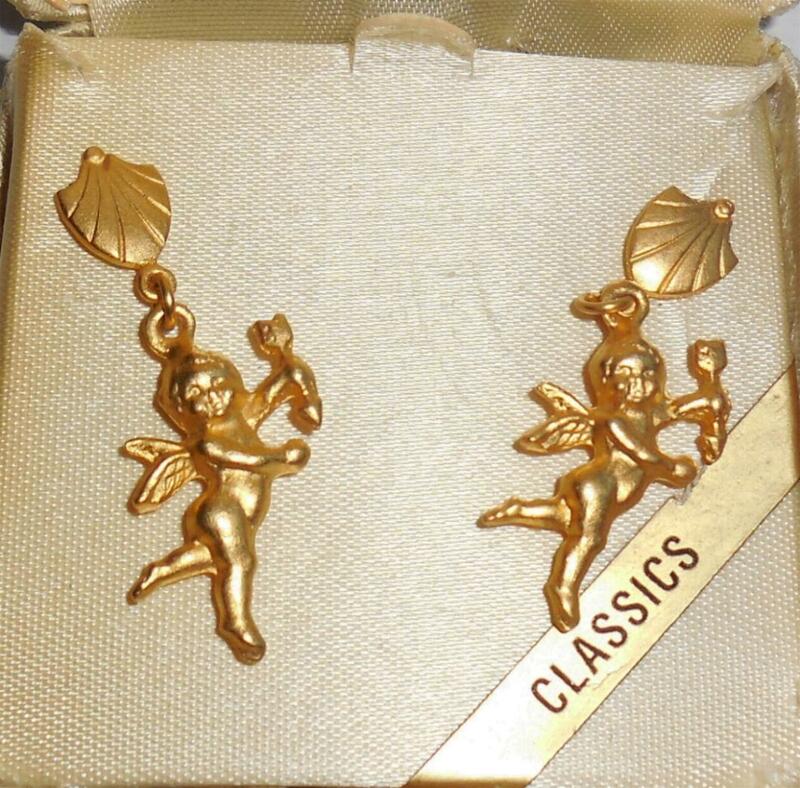 A nice, large pair of showy pair of earrings for any vintage plastic jewelry collection. This is a beautifully made large vintage carved translucent bakelite root beer/tortoise color horse head pin. Guaranteed to be old, original bakelite.....Not reproduction. It is Simichrome tested and Guaranteed old estate bakelite. The original brass chain, metal eye and original c clasp are present and intact. Size measures 2 3/8″ by 2 1/4″ The metal is age worn is not polished out. The horse head is very deeply carved with strong recesses and good detail. Very well-made. Bakelite has lovely translucence and is very thick. Not worn down. Other than some surface scuffs it is in excellent condition. No chips or cracks or breaks. No repair. No alteration. Completely original from estate. Not touched in any way. 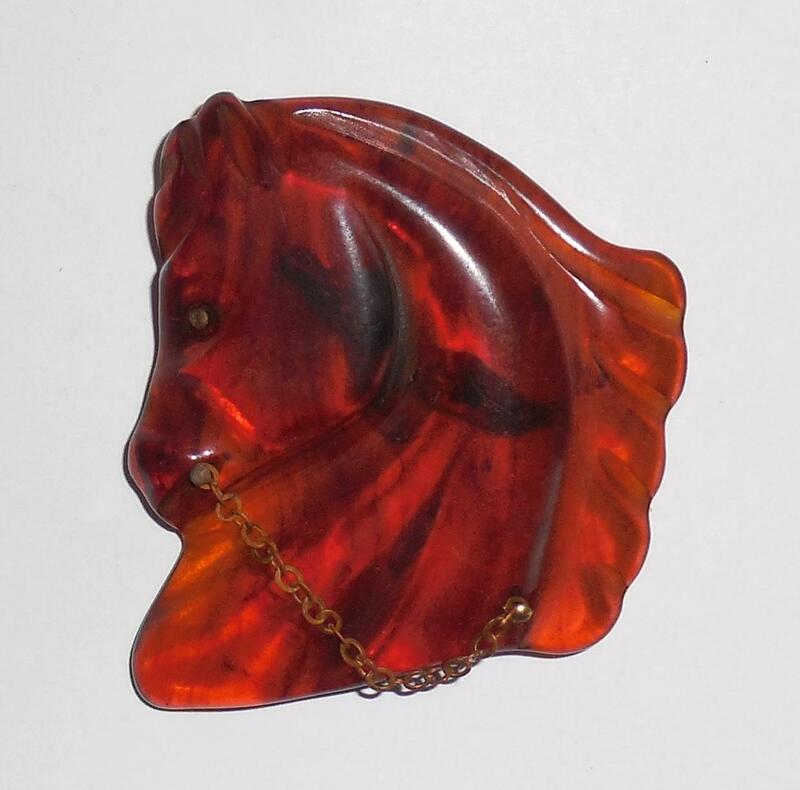 Great example of the harder to find original translucent horse head for your bakelite jewelry collection. 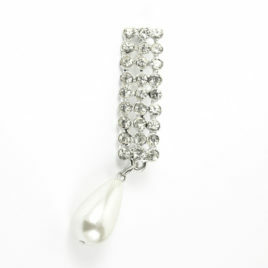 Vintage Unused 1970 Rhinestone Large Teardrop Dangle Pearl Pin - showy vintage 1960s to 1970s silverplated rhinestone pin with a large faux pearl drop dangle. From an old jeweler estate and never used. This jeweler was distributor for Goldette, Hollycraft, Florenza, VanDell, and many other costume houses back in the 1960s and 1970s. This piece has beautiful, crisp, clean, bright, sparkly rhinestones and very, very thick silverplate. Size is 3.25" north to south when hung vertically. Width across the rhinestone bar is 9/16". The large faux pearl is 28mm and cream white color. The rhinestone section alone is 2" long. No wear. Beautiful condition estate find. This is a lovely example of exaggerated faux pearl and rhinestone jewelry for your vintage costume collection. Vintage Unused Signed Florenza 1960s Silver Seashell Bracelet Adj. Old Jeweler Estate Store Stock in beautiful condition with a deep dark antique finish in the silverplate. Almost looks like shiny gunmetal jewelry. It is a silver rolling style bracelet composed of seashells. It is very well made with thick chaining and well detailed. Size is Adjustable 7" long to 7 3/4". 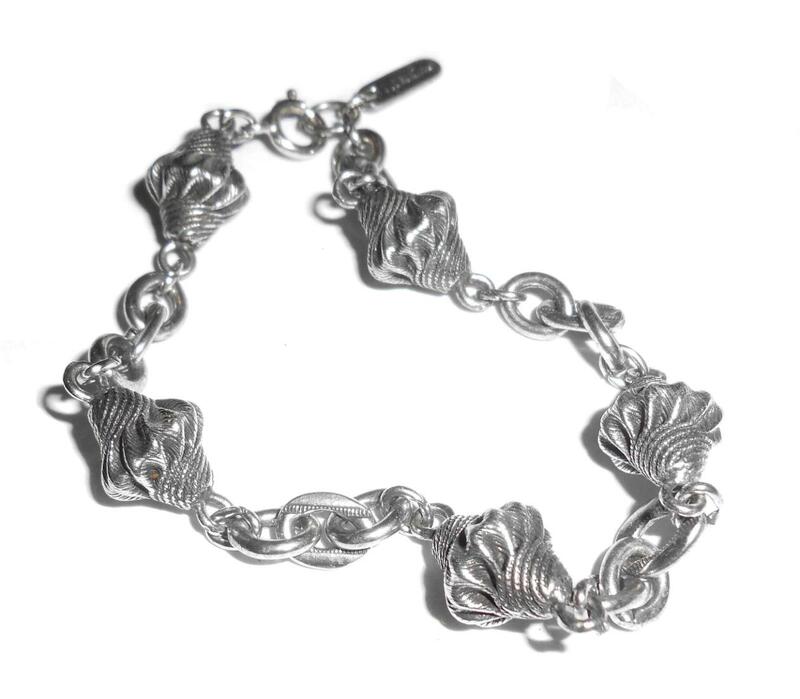 A lovely signed vintage statement bracelet in wonderful condition for your collection. 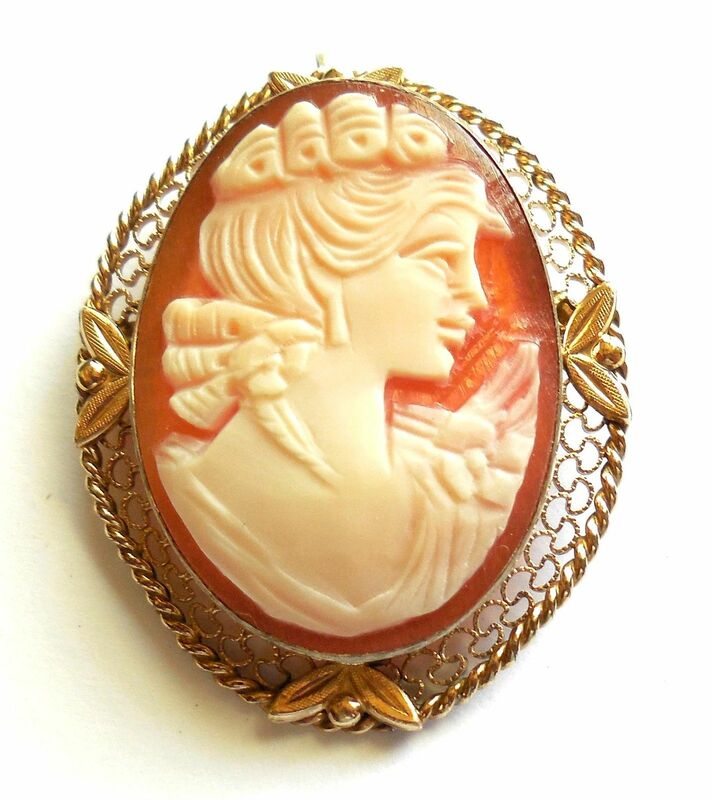 Absolutely gorgeous example of vintage Van Dell natural shell cameo jewelry.... It is well made and beautifully deep carved throughout. This is vintage mid century signed Van Dell cameo portrait pin and is marked 12K gold filled Van Dell. It is completely original. No alterations. The fancy filigree frame is much stronger gold color than the photos. No wear to the gold. Excellent Condition overall, very gently used. No damage or repair. The back has a light age residue which has not been cleaned. The face has very beautiful, detailed carved work with unusually fancy hair, chiseled nose, well-defined open intaglio eye, thick lips, up slanted mouth, fancy flower decorated dress and matching flower in hair. Size is 1 1/2″ tall by 1 1/4″ wide across. This is a lovely piece of estate jewelry for your cameo collection. Vintage Victorian Etruscan Revival Long Dangle Clip Earrings Shoulder Duster Earrings. Old Jeweler Estate Store Stock in good as new condition. Never used!! They are heavily silverplated with a dark antique finish in the grooves. From the 1950s-60s. Fronts are very ornate with thick filigree open work and Etruscan ball design throughout. They are also light weight and easy to wear. Each earrings measures 2 5/8" tall north to south. The tops are leverback hooks and are still strong. 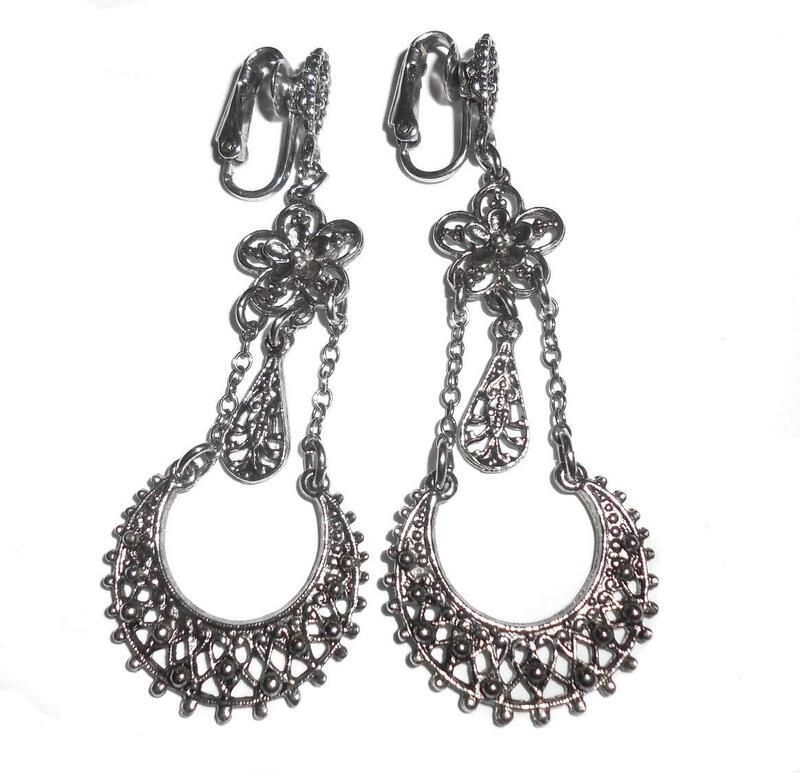 The center of each earrings has a dangle which flows freely in between the chain linkage. This is a beautiful example of mid century Victorian Revival jewelry in crisp clean unused condition for your collection. They are very intricately detailed and showy!! 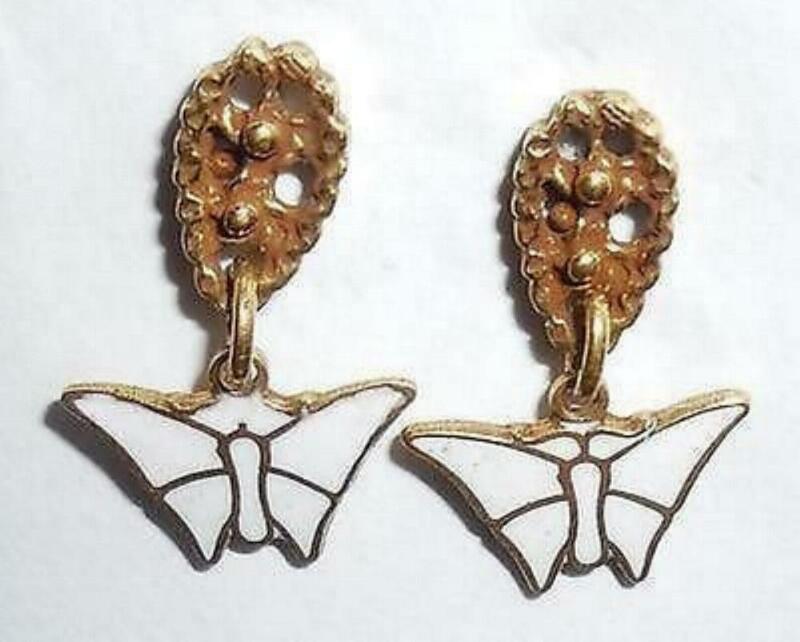 This is a small pair of vintage white enameled butterfly earrings with solid 10K yellow gold posts. Originally made in the 1970s for people with allergies to impure metals. Posts are jeweler tested and guaranteed to be solid 10K gold……not plated or filled. The rest of the earrings are enamel on brass. Size is 13/16″ long from top to bottom of butterfly dangle. Width is 1/2″ across the wing span. No wear. No damage. No repair. This is a lovely pair of vintage enameled butterfly earrings for your collection. 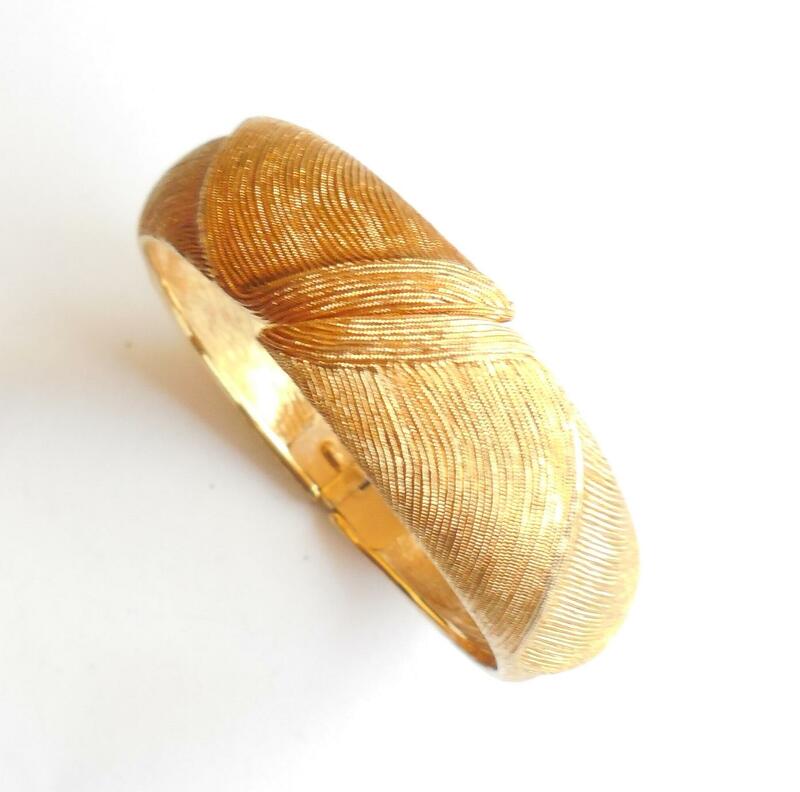 Vintage Wide Monet Clamper Cuff Runway Bracelet NO WEAR This is a fabulous vintage Monet large runway clamper bangle cuff bracelet. It is almost 3/4" wide across the outside and has a very deeply textured modernist overlapping wave pattern. Size is 2 1/4" across the inside open space. The inside diameter is 7 1/4". Beautiful crisp, clean condition. NO Gold Wear. No damage. No repair. Clamper works easily. A beautiful addition for your vintage jewelry collection. This item is all bright, shiny, crisp, yellow gold plated. 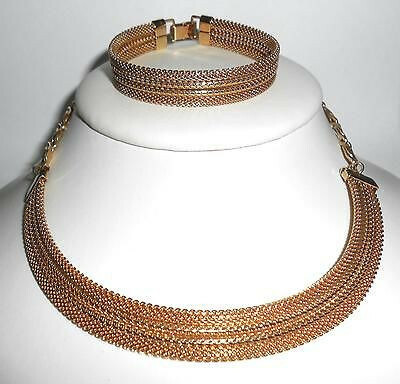 This is a vintage Emmons flexible necklace and bracelet set. Both are in superb NO GOLD WEAR condition. The necklace is adjustable and will fit most neck sizes. Length is 18" including the front curve. The bracelet is 7 3/8" with the clasp closed. Both pieces are in impeccable, clean, original condition. No wear to the gold and no visible sign of use. From an estate and rarely used if ever. A lovely well made vintage addition for your collection. 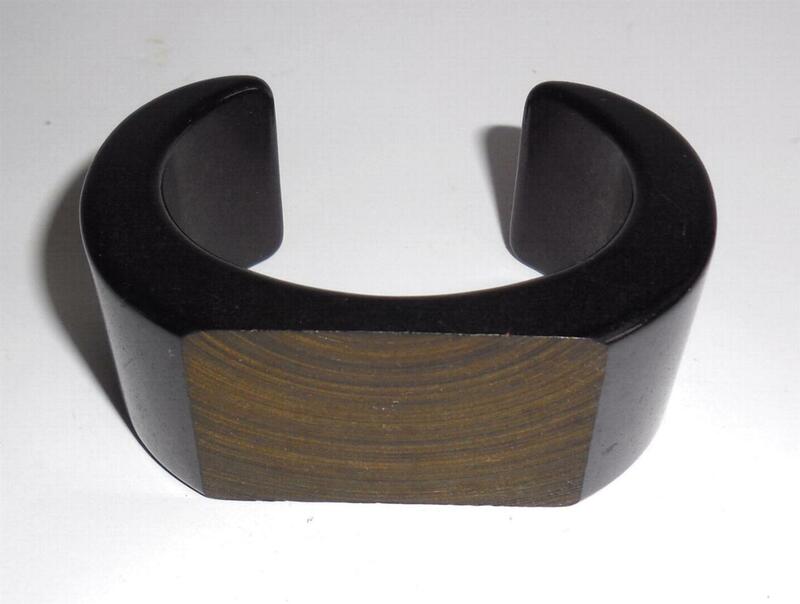 Very thick, wide, chunky vintage black plastic open cuff bracelet with a textured carved top. It looks good the way it is but could have been intended to have enameling or something solid applied to the top. Unsure which. Size is small. Will fit a wrist size 5 1/2" to 6". The outside measures 1 1/4" wide across. Thickness/Depth is 3/8" from top corners to flat back. Inside circumference is 6" around. This is a lovely chunky open cuff bracelet for your vintage plastic jewelry collection. Looks and feels like bakelite but is actually a deep colored heavy black plastic. 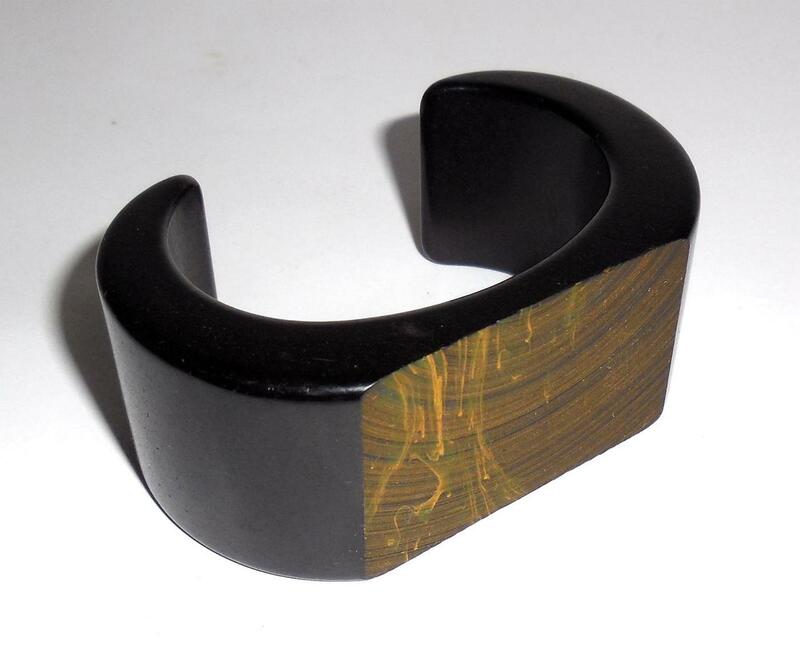 Very thick, wide, heavy, chunky vintage black plastic open cuff bracelet with a textured carved top and yellow paint drippings. Probably intended to have enameling or something solid applied to the top or just a paint error during the making. Unsure which. Size is small. Will fit a wrist size 5 1/2" to 6". The outside measures 1 1/4" wide across. Thickness/Depth is 3/8" from top corners to flat back. Inside circumference is 6" around. This is a lovely chunky open cuff bracelet for your vintage plastic jewelry collection. Looks and feels like bakelite but is actually a deep colored heavy black plastic.